A new life, work, eat, and play! Shakeology is the AMAZING meal replacement shake from beachbody. I love Shakeology, I drink it everyday, and I look forward to it everytime because of how good it tastes. video of 100 doctors talking about shakeology. When you say that all I can think about is the crap you are already spending $4 a day on. Lets look at that fast food meal you are getting 3-4 day’s a week, and we can’t forget the $5 dollar drink from starbucks every morning before work, then there are the frozen box dinners you eat almost everyday, that big glup you have with lunch, don’t forget that one, what about the “Health bar” you have for a snack? OH! Don’t think I forgot all the supplements you take to make up for all the other crap you are putting in your body, we can’t miss them. We have a multivitamin and mineral, antioxidents, Digestive enzyme, Adaptogen, phytonutrient ,Pro-biotic, prebiotics, and protein. If you don’t know much about supplements, that’s a hell of a lot of REALLY good stuff that you really should be getting, but pretty much no one does from their food, and most people even with good intentions of getting it from supplements on get maybe half of this stuff, and maybe a quarter of what’s in Shakeology. 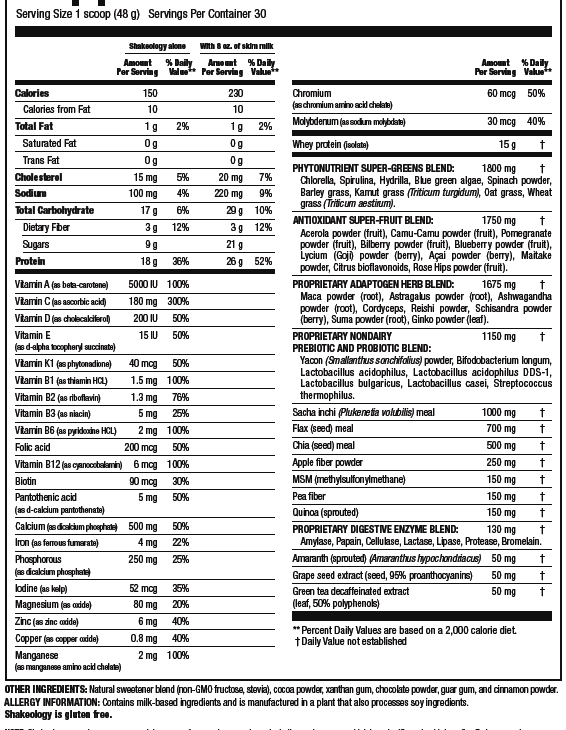 Here are the nutritional facts so you can take a look for yourself. Alright, so we already know about how much people spend on the “food” crap that they put in their body, but what about the supplements? Well, being the nerd I am decided to research it to find out for myself what the cost would be to get what is in shakeology in supplements else where. Alright, so Shakeology is $120, with free shipping, breaks down to 4 dollars a day. Now lets look at the supplements to see what we come up with. Total for all of that, $159 before any tax and shipping added in. Also, everything I found, was the cheapest stuff I could find, most of it is utter crap and you maybe, MAYBE get a SMALL effect from taking it, most of it ends up being fillers anyway, and most of them (ie Antioxidents) are single antioxidents, where as Shakeology has 10 different ones. So you are looking $5.30 a day from that. Alright, we the the average American spends $5 a day on fast food, pop, candy a day! Now, let’s just say they only did the during the work week, so 5 day’s a week, that’s $25 a week, or $100 a month. Now, lets combine the cost of the starbucks and the fast food and we get $163.60 a month on just coffee and a crappy meal. So since we are doing that we need to take some supplements to make up for the crap we are taking it, right!? So let’s add that in now and we are at $322.60 a month for that stuff, and when we break that down to cost per day we are looking at 10.75 a day. Okay, hold on a minute. You are telling me you can’t spend 4 dollars a day on something to improve your healthy and quality of life? Not for you? Not for your family? You just can’t afford because of the $10.75 you spend per day on DECREASING you quality of life, that makes sense. Alright, so know what if you add in Shakeology, but get rid of all the other stuff we talked about, what then. You could be saving $6.75 per day, or $202.60 a month if you prefer. Save money, feel better, look better versus lose money, feel like crap, look like crap? Yeah, it’s an easy choice for me. Check out this video of me talking about this very subject. This chart was made by Chris Potter, an awesome member of team ALLegiance.